This article is about the astronomical term. Solar eclipse of August 11, 1999, as seen from France. 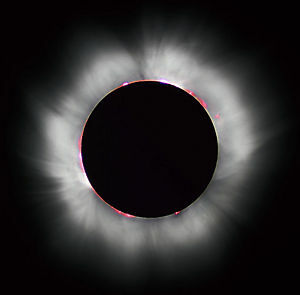 A corona is a type of plasma "atmosphere" of the Sun or other celestial body, extending millions of kilometers into space, most easily seen during a total solar eclipse but also observable in a coronagraph. The Latin root of the word corona means "crown." The high temperature of the corona gives it unusual spectral features, which led some to suggest, in the nineteenth century, that it contained a previously unknown element, "coronium." These spectral features have since been traced to highly ionized iron (Fe(XIV)) which indicates a plasma temperature in excess of 106 kelvin. The corona is divided into three parts. The K-corona (K for continuum) interfaces directly with the chromosphere and is created by sunlight scattering off electrons. The E-corona (E for emission) contains abundant calcium and iron. The F-corona (F for Fraunhofer) is created by sunlight bouncing off dust particles. The Sun's corona is much hotter (by a factor of nearly 200) than the visible surface of the Sun: The photosphere's average temperature is 5800 kelvin compared to the corona's one to three million kelvin. The corona is 10−12 as dense as the photosphere, however, and so produces about one-millionth as much visible light. The corona is separated from the photosphere by the relatively shallow chromosphere. The exact mechanism by which the corona is heated is still the subject of some debate. Likely possibilities include induction by the Sun's magnetic field and sonic pressure waves from below (the latter being less probable now that coronae are known to be present in early-type, highly magnetic stars). The outer edges of the Sun's corona are constantly being transported away due to open magnetic flux generating the solar wind. A drawing demonstrating the configuration of solar magnetic flux during the solar cycle. The Corona is not always evenly distributed across the surface of the sun. During periods of quiet, the corona is more or less confined to the equatorial regions, with coronal holes covering the polar regions. However, during the Sun's active periods, the corona is evenly distributed over the equatorial and polar regions, though it is most prominent in areas with sunspot activity. The solar cycle spans approximately 11 years, from solar minimum to solar maximum, where the solar magnetic field is continually wound up (due to a differential rotation at the solar equator; the equator rotates quicker than the poles). Sunspot activity will be more pronounced at solar maximum where the magnetic field is twisted to a maximum. Associated with sunspots are coronal loops, loops of magnetic flux, upwelling from the solar interior. The magnetic flux pushes the hotter photosphere aside, exposing the cooler plasma below, thus, creating the dark (when compared to the solar disk) spots. Coronal loops are the basic structures of the magnetic solar corona. These loops are the closed-magnetic flux cousins of the open-magnetic flux that can be found in coronal hole (polar) regions and the solar wind. Loops of magnetic flux well up from the solar body and fill with hot solar plasma. Due to the heightened magnetic activity in these coronal loop regions, coronal loops can often be the precursor to solar flares and Coronal Mass Ejections (CMEs). Solar plasma feeding these structures are heated from under 6000K to well over 1×106K from the photosphere, through the transition region, and into the corona. Often, the solar plasma will fill these loops from one foot point and drain from the other (siphon flow due to a pressure difference, or asymmetric flow due to some other driver). This is known as chromospheric evaporation and chromospheric condensation respectively. There may also be symmetric flow from both loop foot points, causing a buildup of mass in the loop structure. The plasma may cool in this region creating dark filaments in the solar disk or prominences off the limb. 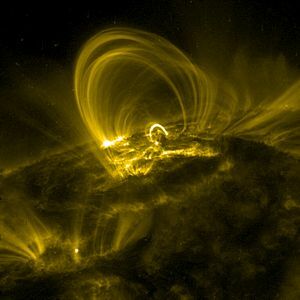 Coronal loops may have lifetimes on the order of seconds (in the case of flare events), minutes, hours, or days. Usually coronal loops lasting for long periods of time are known as steady state or quiescent coronal loops, where there is a balance between loop energy sources and sinks. Coronal loops have become very important when trying to understand the current coronal heating problem. Coronal loops are highly radiating sources of plasma and therefore easy to observe by instruments such as TRACE, they are highly observable laboratories to study phenomena such as solar oscillations, wave activity and nanoflares. However, it remains difficult to find a solution to the coronal heating problem as these structures are being observed remotely, where many ambiguities are present (that is, radiation contributions along the line of sight). In-situ measurements are required before a definitive answer can be arrived at, but due to the high plasma temperatures in the corona, in-situ measurements are impossible (at least not yet). Generated by solar flares or large solar prominences, "coronal transients" (also called coronal mass ejections) are sometimes released. These are enormous loops of coronal material traveling outward from the Sun at over a million kilometers per hour, containing roughly 10 times the energy of the solar flare or prominence that triggered them. Some larger ejections can propel hundreds of millions of tons of material in to space at roughly at 1.5 million kilometers an hour. The coronal heating problem in solar physics relates to the question of why the temperature of the Sun's corona is millions of kelvins higher than that of the surface. The high temperatures require energy to be carried from the solar interior to the corona by non-thermal processes, because the second law of thermodynamics prevents heat from flowing directly from the solar photosphere, or surface, at about 5800 kelvin, to the much hotter corona at about 1 to 3 MK (parts of the corona can even reach 10 MK). The amount of power required to heat the solar corona can easily be calculated. It is about 1 kilowatt for every square meter of surface area on the Sun, or 1/40000 of the amount of light energy that escapes the Sun. This thin region of temperature increase from the chromosphere to the corona is known as the transition region and can range from tens to hundreds of kilometers thick. An analogy of this would be a light bulb heating the air surrounding it hotter than its glass surface. The second law of thermodynamics would be broken. 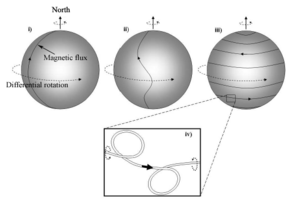 Many coronal heating theories have been proposed, but two theories have remained as the most likely candidates, wave heating and magnetic reconnection (or nanoflares). Through most of the past 50 years, neither theory has been able to account for the extreme coronal temperatures. Most solar physicists now believe that some combination of the two theories can probably explain coronal heating, although the details are not yet complete. The NASA mission Solar Probe + is intended to approach the sun to a distance of approximately 9.5 solar radii in order to investigate coronal heating and the origin of the solar wind. The wave heating theory, proposed in 1949 by Evry Schatzman, proposes that waves carry energy from the solar interior to the solar chromosphere and corona. The Sun is made of plasma rather than ordinary gas, so it supports several types of waves analogous to sound waves in air. The most important types of wave are magneto-acoustic waves and Alfvén waves. Magneto-acoustic waves are sound waves that have been modified by the presence of a magnetic field, and Alfvén waves are similar to ULF radio waves that have been modified by interaction with matter in the plasma. Both types of waves can be launched by the turbulence of granulation and super granulation at the solar photosphere, and both types of waves can carry energy for some distance through the solar atmosphere before turning into shock waves that dissipate their energy as heat. One problem with wave heating is delivery of the heat to the appropriate place. Magneto-acoustic waves cannot carry sufficient energy upward through the chromosphere to the corona, both because of the low pressure present in the chromosphere and because they tend to be reflected back to the photosphere. Alfvén waves can carry enough energy, but do not dissipate that energy rapidly enough once they enter the corona. Waves in plasmas are notoriously difficult to understand and describe analytically, but computer simulations, carried out by Thomas Bogdan and colleagues in 2003, seem to show that Alfvén waves can transmute into other wave modes at the base of the corona, providing a pathway that can carry large amounts of energy from the photosphere into the corona and then dissipate it as heat. Another problem with wave heating has been the complete absence, until the late 1990s, of any direct evidence of waves propagating through the solar corona. The first direct observation of waves propagating into and through the solar corona was made in 1997, with the SOHO space-borne solar observatory, the first platform capable of observing the Sun in the extreme ultraviolet for long periods of time with stable photometry. Those were magneto-acoustic waves with a frequency of about 1 millihertz (mHz, corresponding to a 1,000 second wave period), that carry only about 10 percent of the energy required to heat the corona. Many observations exist of localized wave phenomena, such as Alfvén waves launched by solar flares, but those events are transient and cannot explain the uniform coronal heat. Magnetic reconnection is hypothesized to be the mechanism behind solar flares, the largest explosions in our solar system. 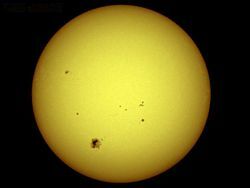 Furthermore, the surface of Sun is covered with millions of small magnetized regions 50–1,000 km across. These small magnetic poles are buffeted and churned by the constant granulation. The magnetic field in the solar corona must undergo nearly constant reconnection to match the motion of this "magnetic carpet," so the energy released by the reconnection is a natural candidate for the coronal heat, perhaps as a series of "microflares" that individually provide very little energy but together account for the required energy. The idea that micro flares might heat the corona was put forward by Eugene Parker in the 1980s but is still controversial. In particular, ultraviolet telescopes such as TRACE and SOHO/EIT can observe individual micro-flares as small brightenings in extreme ultraviolet light, but there seem to be too few of these small events to account for the energy released into the corona. The additional energy not accounted for could be made up by wave energy, or by gradual magnetic reconnection that releases energy more smoothly than micro-flares and therefore doesn't appear well in the TRACE data. Variations on the micro flare hypothesis use other mechanisms to stress the magnetic field or to release the energy, and are a subject of active research in 2005. ↑ M.J. Aschwanden, Physics of the Solar Corona. An Introduction (Berlin: Springer, 2004, ISBN 3540223215). ↑ Richard Corfield, Lives of the Planets (New York: Basic Books, 2007, ISBN 9780465014033). ↑ Hannes Alfvén, Magneto hydrodynamic waves, and the heating of the solar corona MNRAS. 107 (1947): 211–219. Aschwanden, Markus J. 2006. Physics of the Solar Corona: An Introduction with Problems and Solutions. New York: Springer ISBN 3540307656. Klein, K.L. and A.L. MacKinnon. 2007. The High Energy Solar Corona: Waves, Eruptions, Particles. Berlin, DE: Springer. ISBN 354071569X. Harvey, John W., Neal E. Hurlburt, Carolus J. Schrijver, and Oddbjorn Engvold. 2001. Physics of the Solar Corona and Transition Region. Boston: Kluwer Academic Publishers. ISBN 0792370430. Solar and Heliospheric Observatory, including near-real-time images of the solar corona. This page was last modified on 24 March 2017, at 19:50.